Ukraine is currently the only European country hosting a war. The War in Donbass, as it has been called, is currently being waged between Ukraine proper and Russian-backed separatists in an eastern region of the country. In a new film, titled simply Donbass, visionary filmmaker Sergei Loznitsa thoughtfully explores this conflict that has left over 10,000 dead, 3,000 of whom were civilians. Though it is a war film, Donbass features none of the trappings one might associate the genre. There are no valiant set pieces; there are no moralising speeches. There are no heroes; there is no heroism. With Donbass, Loznitsa instead shows us a corner of Ukraine rocked by a profound moral and intellectual rot. 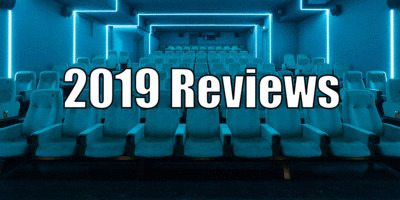 The film may not be pleasant, but it treats the ongoing sociopolitical conflict with a clarity, a vitality, and a sense of mystery that few other working filmmakers could muster. Donbass is worth the time of any cinephile who maintains parallel interests in global politics. Loznitsa’s previous fiction films feature clear protagonists: a truck driver in My Joy (2010), a woman searching for her imprisoned husband in A Gentle Creature (2016), the soldiers of In the Fog (2012). In these films (especially My Joy and A Gentle Creature), the characters are forced to confront a menagerie of ghoulish supporting characters that throng every one of Loznitsa’s picaresque scenes. With Donbass, however, we are not provided with an ambivalent hero to whom we can cleave as we navigate Loznitsa’s distinctly Slavic nightmares. Donbass begins with exasperated civilians reacting to TV crews to the explosion of a bus. After lingering on the wreckage, the austere title card comes onto the screen as the Ukrainian national anthem bursts onto the soundtrack. From here, Donbass shuttles us from vignette to vignette, forcing us to confront a suite of eerie soldiers and civilians, showing us the suffering they endure and the cruelty they can be capable of. Loznitsa leads us from military checkpoint to military checkpoint, from boardrooms to bunkers, showing us all walks of life swept up in, sheltering from, sneering in the face of, and profiteering off of this fraught conflict. Certain filmmakers, in tandem with casting directors, can create unique cinematic worlds by casting distinct - almost unreal - performers in even the most inconsequential roles. Think films by the Coen brothers or Fellini. Loznitsa deserves to be held among the best practitioners of this particular technique. Each episode features an anonymous citizen of the Donbass region whose distinct appearance seems somehow symptomatic of their general character. A corpulent man with a sickeningly smug demeanour denounces the management of a poorly run hospital to its rank and file workers, promising changes. His simpering demeanour becomes all the more monstrous when we realise that the hospital management has bribed him with money and prostitutes to give false assurance to the workers. A separatist military leader barks at German journalists with the same aggressive jocularity as his subordinates. A wedding occurs between a man and a woman whose strange appearance seems to bloom from their strange indifference to the suffering happening around them. Every face that Loznitsa manages to cast adds to the senseless wartime environment by virtue of its unique, unusual, or expressive qualities, all seen under Loznitsa’s (and cinematographer Oleg Mutu’s) harsh, cold lighting style. Loznitsa’s parade of human ghouls is inherently unsettling and fascinating in and of itself, but the filmmaker manages to go even further by giving each vignette an electric charge that builds and builds in intensity before it yields to the next vignette. Loznitsa gives these episodes their maddening energy by repeating an idea over and over, giving each episode a compelling rhythm. The man brought in to mollify the hospital workers goes on a fake tirade against management for a surprisingly long time - a move that makes the revelation of his duplicity all the more shocking. In the film’s coup de théâtre, the spooky emcee for the raucous wedding for the boorish couple singles out various separatist officials in attendance ad nauseum. Loznitsa also imbues certain sequences with an effective sense of surreality: in one scene, a separatist official strong-arms a civilian into surrendering his car. During the encounter, we see a pile of cell phones on a desk that we can presume to have been confiscated. As the official’s overreach becomes more and more apparent - and as the civilian attempts in vain to resist surrendering his car - various phones in the large pile begin to ring. The docile sounds of the phone subtly betray a strange and sinister reality: the unheard and unseen people dialing those numbers are trying to reach people who can no longer be reached. Though they are small details, the various ringtones have the visceral impact of unanswered desperate shouts in the wind as the official’s cruelty, a quality shared with so many other characters in Donbass, slowly reveals itself. Donbass is as stylistically fascinating as all of Loznitsa’s fiction work, but with this fourth feature, the political message that the director seems to signal is less oblique. Where My Joy and A Gentle Creature thrive on political ambiguity, Donbass makes its politics more directly felt. We see characters pass through military checkpoints maintained by both the Ukrainian government and the separatists; while Ukrainian military members do use muted scare tactics to intimidate people crossing in and out of occupied territory, the separatist military checkpoints are open season for oafish harassment and arbitrary strip searches. The separatist forces also parrot talking points that liken Germans to "fascists" that a unified Russia was able to defeat in WWII, a point that Vladimir Putin himself has publicly stated regarding the War in Donbass. In the film’s most profoundly upsetting scene, separatist soldiers tie an arrested man to a lamppost. The man, who has the Ukrainian flag draped around his shoulders, becomes a silent target for nasty invective hurled at him by separatist sympathisers. They turn violent against the helpless man quickly, all while espousing prepackaged talking points that, like the accusations of anti-Russian fascism, do not seem to hold up under basic scrutiny. To its credit, Donbass is not a didactic film; it is expansive and explores the conflict from varied and surprising angles. But nevertheless, Loznitsa’s strange spectacle puts forth the view that pro-Russian Ukrainian separatists and their sympathisers are confused, angry, and cruel, wreaking tragic havoc in a small pocket of the world. Donbass may seem over the top at times, but if you read journalism like Michael Schwirtz’s recent piece on Russia’s seedy, violent presence in Ukraine, you’ll see that Donbass’s chaotic strangeness springs, tragically, from reality. 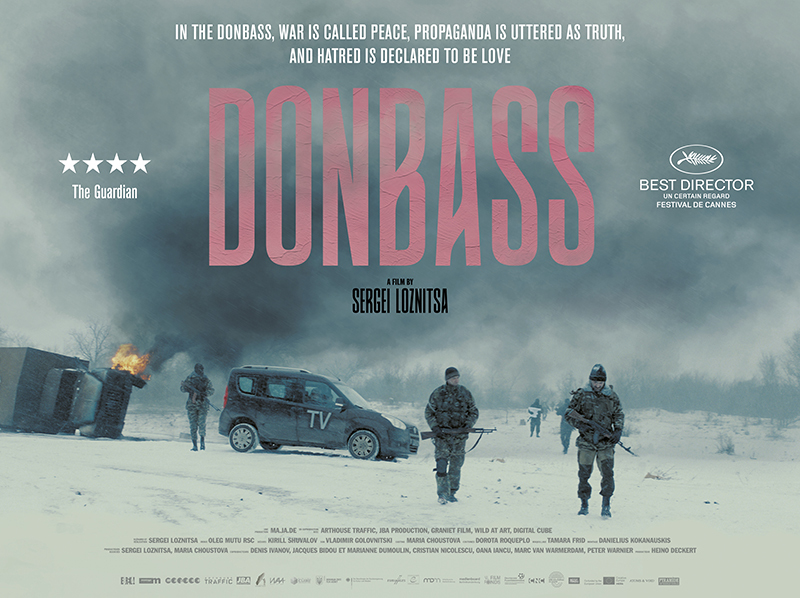 Donbass is in UK/ROI cinemas April 26th.